Its been awhile since I've had a bella terra post and I am WAY overdue. Things are actually happening out there in our 20' x 20' patch of veggie heaven and its not just about herbs anymore. But, because I'm behind and because spring herbs should be prolific pretty much everywhere right now, I'm going to give you another herb post. But don't worry, not only did we plant tomatoes, cucumbers and bell peppers today, we also harvested our first spinach and bibb lettuce as well so you should be seeing some diversity around here very soon. The chives are in full bloom...aren't they lovely? I clip them to put in vases around our house, not only because I love their color but also because if the flowers are left to reach full maturity in the garden we will have chives popping up in every nook and cranny next year. They are incredibly hardy and reproduce like crazy - we divide them to give to friends each year just to keep things under control. Luckily, we are big fans of cooking with chives in our household so those we keep rarely waste away in the garden. 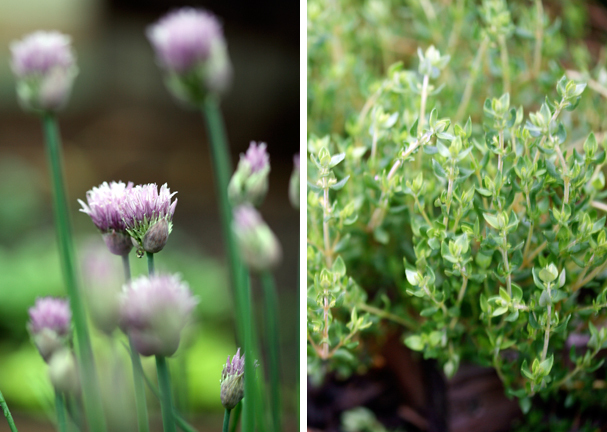 We've also recently discovered that thyme is a very useful herb in a variety of dishes. Keep it whole in soups or as a bed for baked white fish or salmon (it will infuse the fish with a delightful flavor and scent). Or, gently pluck the leaves from the stem and stir them into a buttery barley risotto, our newest discovery and one that fast-tracked its way to the top of our favorites list. This meal is one that I concocted while sitting at my desk in the office, waiting for the last 30 minutes of the work day to tick by. My mind tends to wander towards food often, especially when dinner is eminent. On this particular day I realized that things were getting a little sparse in our refrigerator, other than a little baggie of brussels sprouts I'd picked up at Whole Foods the weekend before that needed to be cooked as soon as possible. We always keep a variety of grains in our pantry and luckily so because on this day, thoughts of risotto topped with golden brussels sprouts danced into my head and refused to be silenced. I wanted a risotto heartier than the typical white rice variety so chose to use barley instead. If you've never tried using barley in risotto I insist that you do, as soon as possible. 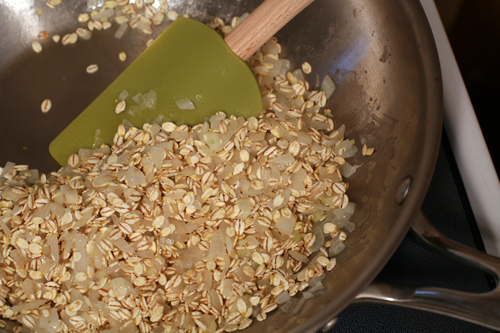 Barley adds an earthy depth to the dish that is especially good with herbs, spinach or mushrooms. It may take a bit longer to cook than the traditional rice dish but it is more flavorful and filling*. Brian and I ate in complete silence this night, save the occasional "this is SO good" or "I could eat this EVERY night" comments. The thyme complements the barley and the brussels sprouts beautifully, and the high-quality butter was worth the extra splurge. I used Heidi's recipe for the brussels sprouts, which never disappoints. They were perfect. I'd like to say something about risotto. Not only is it delicious, its relatively simple. I think it gets a bad rap because of the rather lengthy period of stirring that it takes to reach perfect creaminess, but if you've got someone to hand the spatula over to every now and then and a glass of white wine to sip when its your turn, the task really isn't that daunting. And it is completely worth the effort. Heat the broth in a small saucepan over medium heat and keep at a low simmer. Melt 2 tbsp butter in a large, heavy-bottom saute' pan. Add the onion and garlic and saute' over medium heat for 3-5 minutes, until translucent. Add the barley and stir to coat with the butter, about 1 minute. Add the white wine to the pan and stir briskly to deglaze. When the wine has evaporated add 1/2 cup of broth to the pan. Stir until the liquid has been absorbed and repeat. Stir often, adding broth 1/2 cup at a time and letting it absorb before adding another. 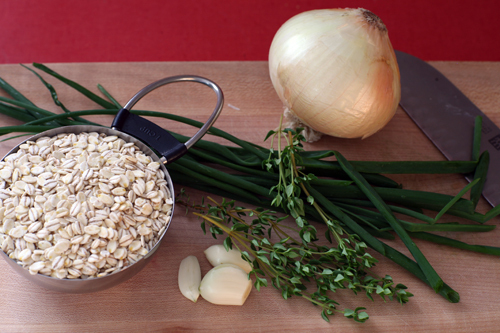 You may not use all of the broth, but you'll know the risotto is done when the barley is tender but not mushy. The risotto should be creamy and hold together without any liquid around the edges. Stir in the remaining 2 tbsp butter, parmesan cheese and herbs. Salt and pepper to taste. 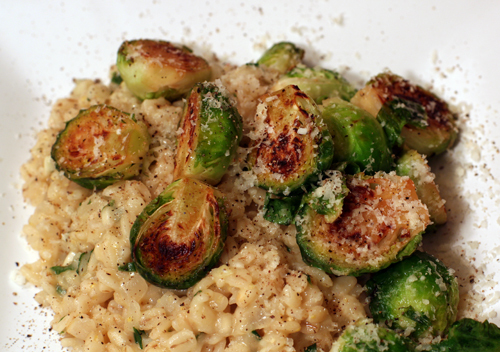 While risotto is cooking, prepare the brussels sprouts. Brussels sprouts should be rubbed in olive oil before being added to the pan. Heat 1 tbsp of olive oil in large non-stick pan. Place brussels sprouts, flat-side down, in pan and sprinkle generously with salt and pepper. Cover and let cook for about 5 minutes. Remove a sprout from the pan after 5 minutes and test for tenderness. If tender, remove cover from pan and toss sprouts to quickly brown on round side, about 2 minutes. Dish risotto immediately onto plates. 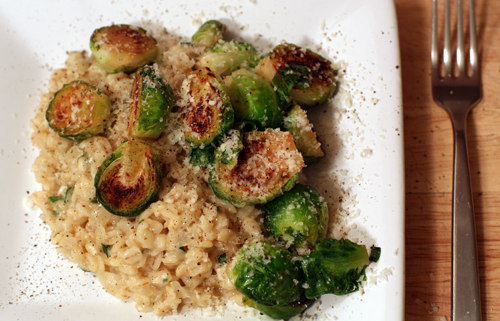 Top with brussels sprouts and sprinkle with parmesan cheese and freshly ground pepper. *Don't get me wrong, I love a good arborio rice risotto as well, but I typically reserve it for when the risotto is a side rather than the centerpiece. Arborio rice has a milder flavor and is tasty with butternut squash or other sweeter vegetables like beets.